The median nerve in the wrist enables movement and feeling in parts of the hand. Pressure on this nerve leads to a condition called Carpal Tunnel Syndrome. This syndrome has several damaging effects on the hand and fingers, including weakness, tingling, numbness, and even muscle damage. The median nerve is primarily responsible for the thumb side of the hand. This area which includes the thumb, palm, index, middle fingers and thumb side of the ring finger is highlighted in the image below. The carpal tunnel is the area of your wrist where the nerve enters the hand. This tunnel is typically narrow and very sensitive. Any swelling can pinch the nerve and cause numbness, tingling, weakness, and pain. This is called carpal tunnel syndrome. 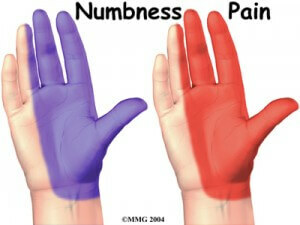 Some who suffer from this syndrome were born with a small carpal tunnel. However, most commonly carpal tunnel syndrome develops after repeatedly using the wrist in the same motion over time, such as playing an instrument, typing with a keyboard, using various hand tools, or play certain sports. Carpal tunnel syndrome occurs most often in people 30 to 60 years old and is more common in women than men. Our team at Spring Creek Medical are experts at helping you recover quickly from any type of Carpal Tunnel condition. The medical doctor, chiropractor, and physical therapist are committed to your health and work together to offer you exceptional care.